1.Snowshoeing. We offer complimentary snowshoes (in all sizes) for our guests to use as they explore our 362-acre property! 2.Sledding. Sterling Ridge also encourages our guests to borrow a complimentary sled to go downhill sledding with friends and family. 3.Cross Country Skiing. Bring your own cross country skis and enjoy our 2+ miles of trails at Sterling Ridge! 4.Snowmobiling. Green Mountain Snowmobile Adventures offers evening guided snowmobile tours through Smugglers’ Notch pass over to Mt. Mansfield (Stowe) ski area and day tours from Jeffersonville on the VAST trail system. Children ages 6 – 12 can participate in mini-snowmobile tours on Thursday, Friday and Sunday evenings. And if you have your own snowmobile, you can access VAST trails and the Lamoille Valley Rail Trail right from Sterling Ridge! 5.Sleigh Rides & Horseback Riding. At Lajoie Valley Stables, right in Jeffersonville, you can reserve private tours on horseback or sleigh for a beautiful ride through the snow. 6.Dog Sledding. Eden Dogsledding, just a half hour from Sterling Ridge, offers a one-of-a-kind experience exploring the Green Mountains. 7.Skiing & Snowboarding. Sterling Ridge is located in the perfect place for easy access to three ski destinations: Smuggler’s Notch, Stowe, and Jay Peak! Travel to any one of these resorts for the day, and then return to your cozy cabin in the woods. 8.Ice Skating. Cambridge Community Center, less than 5 minutes down the road from The Ridge, has an outdoor skating rink you can enjoy, along with skates for rent! 9. Build a Snowman. 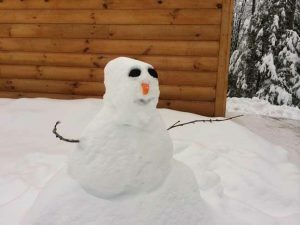 Show off your artistic skills and build a snowman! We have free snowman kits at the office for all guests to enjoy. 10.RELAX & UNWIND. Last but not least, our favorite thing to do at Sterling Ridge: relax and unwind by the fire in your cozy log cabin. Curl up with a blanket, a book, hot cocoa, and enjoy your home away from home this winter. Don’t feel like making the trip to town? Introducing our new Hot Chocolate basket with 2 kinds – peppermint or original along with mini-marshmallows and 2 Sterling Ridge mugs. Forgot your favorite book? Check out our large selection of books in the game room and much more to help you enjoy your vacation. It’s not so bad being “snowed in” when you’re at The Ridge.